Your car's cooling system is really quite remarkable, but most people don't understand how — and how well — it works. The engine in your car runs best at a fairly high temperature. When the engine is cold, components wear out faster, the engine is less efficient and it emits more pollution. So the important role of the cooling system is to permit the engine to heat up as quickly as possible, and then to keep it running at a constant temperature. There are two types of cooling systems found on cars: liquid-cooled and air-cooled; but since most cars are liquid-cooled, we'll focus on that system exclusively here. The cooling system on liquid-cooled cars circulates a fluid through pipes and passageways in the engine. As this liquid passes through the hot engine it absorbs heat, cooling the engine. After the fluid leaves the engine, it passes through a heat exchanger, or radiator, which transfers the heat from the fluid to the air blowing through the exchanger. The cooling system involves a lot of plumbing. Let's start at the pump and work our way through the system in more detail. Basically, the pump sends the fluid into the engine block, where it makes its way through passages in the engine around the cylinders. Then it returns through the cylinder head of the engine. The thermostat is located where the fluid leaves the engine. 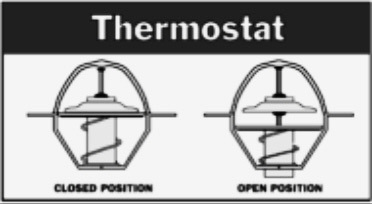 The plumbing around the thermostat sends the fluid back to the pump directly if the thermostat is closed. If it is open, the fluid goes through the radiator first and then back to the pump. There's also a separate circuit for the heating system. This circuit takes fluid from the cylinder head and passes it through a heater core and then back to the pump. And on cars with automatic transmissions, there is normally also a separate circuit for cooling the transmission fluid built into the radiator. The oil from the transmission is pumped by the transmission through a second heat exchanger inside the radiator. Cars have to operate in a wide variety of temperatures, from well below freezing to well over 100° F (38° C), so the fluid used to cool the engine has to have a very low freezing point, a high boiling point, and it has to have the capacity to hold a lot of heat. The temperature of the coolant can sometimes reach 250° to 275° F (121° to 135° C). Even with ethylene glycol added, these temperatures would boil the coolant, so something additional must be done to raise its boiling point. The cooling system uses pressure to further raise the boiling point of the coolant. Just as the boiling temperature of water is higher in a pressure cooker, the boiling temperature of coolant is higher if you pressurize the system. Most cars have a pressure limit of 14 to 15 pounds per square inch (psi), which raises the boiling point another 45° F (25° C) so the coolant can withstand the high temperatures. Antifreeze also contains additives to resist corrosion. The water pump is a simple centrifugal pump driven by a belt connected to the crankshaft of the engine. The pump circulates fluid whenever the engine is running. The water pump uses centrifugal force to send fluid to the outside while it spins, causing fluid to be drawn from the center continuously. The inlet to the pump is located near the center so that fluid returning from the radiator hits the pump vanes. The pump vanes then fling the fluid to the outside of the pump, where it can enter the engine. The walls of the cylinder are quite thin and the engine block is mostly hollow. The engine block and cylinder head have many passageways cast or machined in them to allow for fluid flow. These passageways direct the coolant to the most critical areas of the engine. Temperatures in the combustion chamber of the engine can reach 4,500° F (2,500° C), so cooling the area around the cylinders is critical. Areas around the exhaust valves are especially crucial, and almost all of the space inside the cylinder head around the valves that is not needed for structure is filled with coolant. If the engine goes without cooling for too long, it can seize. When this happens, the metal has actually gotten hot enough for the piston to weld itself to the cylinder which usually results in the complete destruction of the engine. One way to reduce the demands on the cooling system is to reduce the amount of heat transferred from the combustion chamber to the metal parts of the engine. 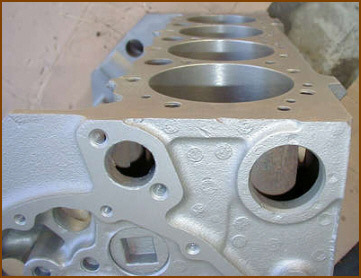 Some engines do this by coating the inside of the top of the cylinder head with a thin layer of ceramic. Since ceramic is a poor conductor of heat, less heat is conducted through to the metal and more passes out of the exhaust. The head of the engine also has large coolant passageways. As noted earlier, a radiator is a type of heat exchanger. It is designed to transfer heat from the hot coolant that flows through it to the air blown through it by the fan. Some cars (e.g., Corvettes) are equipped with aluminum radiators, since they have a higher thermal coefficient than brass or copper units. These radiators are made by brazing thin aluminum fins to flattened aluminum tubes. The coolant flows from the inlet to the outlet through many tubes mounted in a parallel arrangement. The fins conduct the heat from the tubes and transfer it to the air flowing through the radiator. The tubes sometimes have a type of fin inserted into them called a turbulator, which increases the turbulence of the fluid flowing through the tubes. If the fluid flowed very smoothly through the tubes, only the fluid actually touching the tubes would be cooled directly. The amount of heat transferred to the tubes from the fluid running through them depends on the difference in temperature between the tube and the fluid touching it. So if the fluid that is in contact with the tube cools down quickly, less heat will be transferred. By creating turbulence inside the tube, all of the fluid mixes together, keeping the temperature of the fluid touching the tubes up so that more heat can be extracted, and all of the fluid inside the tube is used effectively. Radiators usually have a tank on each side, and inside the tank is a transmission cooler. The transmission cooler is like a radiator within a radiator, except instead of exchanging heat with the air, the oil exchanges heat with the coolant in the radiator. The radiator cap actually increases the boiling point of your coolant by about 45° F (25° C). The cap is actually a pressure release valve, and on cars it is usually set to 15psi. The boiling point of water increases when the water is placed under pressure. When the fluid in the cooling system heats up, it expands, causing the pressure to build up. The cap is the only place where this pressure can escape, so the setting of the spring on the cap determines the maximum pressure in the cooling system. When the pressure reaches 15 psi, the pressure pushes the valve open, allowing coolant to escape from the cooling system. This coolant flows through the overflow tube into the bottom of the overflow tank. This arrangement keeps air out of the system. 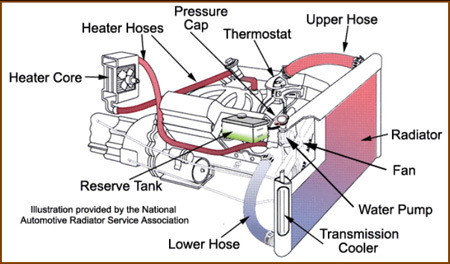 When the radiator cools back down, a vacuum is created in the cooling system that pulls open another spring loaded valve, sucking water back in from the bottom of the overflow tank to replace the water that was expelled. The thermostat's main job is to allow the engine to heat up quickly, and then to keep the engine at a constant temperature. It does this by regulating the amount of water that goes through the radiator. At low temperatures, the outlet to the radiator is completely blocked — all of the coolant is recirculated back through the engine. Once the temperature of the coolant rises to between 180° and 195° F (82°-91° C), the thermostat starts to open, allowing fluid to flow through the radiator. By the time the coolant reaches 200° to 218° F (93°-103° C), the thermostat is open all the way. Like the thermostat, the cooling fan has to be controlled so that it allows the engine to maintain a constant temperature. Later model cars have electric fans. The fans are controlled either with a thermostatic switch or by the engine computer, and they turn on when the temperature of the coolant goes above a set point. They turn back off when the temperature drops below that point. Older cars have engine-driven cooling fans. These fans have a thermostatically-controlled viscous clutch positioned at the hub of the fan, in the airflow coming through the radiator. You may have heard that if you car is overheating you should open all the windows and run the heater with the fan going at full blast. That's good advice, because the heating system is actually a secondary cooling system that mirrors the main cooling system on your car. The heater core, which is located in or under the dashboard, is really a small radiator. The heater fan blows air through the heater core and into the passenger compartment of your car. The heater core draws its hot coolant from the cylinder head and returns it to the pump — so the heater works regardless of whether the thermostat is open or closed.